WON JEE PLASTIC MACHINERY CO., LTD. is a highly-qualified, Taiwan-based supplier and manufacturer of multilayer co-extrusion sheet machine, plastic recycling machine, and pp. The supplier has been recognized as one of the most professional manufacturers in the plastic industry since 1978. With both experience and innovation, the supplier is confident of providing buyers with quality extruding machine. Dedicated in extrusion machinery manufacturing technology development and improvement for more than 32 years, Won Jee provides the equipment with better quality than others. The Multi-layer Plastic Sheet Extrusion Machines from Won Jee feature excellent capacity and great output as following list data. Won Jee not only cares much about quality, but also provide the best after service. With optimum quality of machine, customers will spend less time in purchasing spare parts. 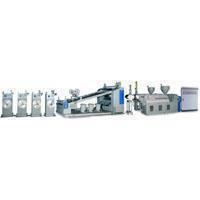 Won Jee offer various extruding equipments for making different products in high efficiency. Get the equipments from Won Jee, what you will own is maximum profit.